As part of the Stitch Fun series, I’ve been dabbling with lattice stitches and whipped and laced stitches. I do a lot of dabbling. And I’m dabbling with a few other things right now, too – one of which I’ll start leaking out to you very soon. I’m excited about it and having So Much Fun with it! Ooooooooooooooh. Can’t wait to show you! 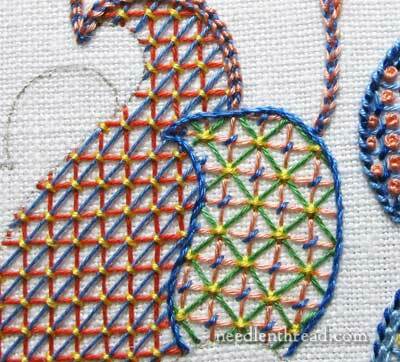 But… but… I must curtail my excitement and stick with today’s subject – which is this Stitch Fun lattice sampler. It’s a lot of fun, too, and for those of you who picked up the Jacobean Jumble pattern and are using it for a similar sampler, I thought I’d show you what I’m doing with it. I’ll show you what I like and what I don’t like, and reiterate an important tip for working with lattice stitches. This is my Jumble so far. And it truly is a jumble. It’s just a conglomeration of this and that, a sampler for working out different stitches and combinations. I went with this jumbled-up drawing rather than a typical line sampler or block sampler because I wanted to work these lattice fillings in various irregular shapes, rather than in square blocks. When working an embroidery design (for example, working a flowery crewel project or something similar), the fillings we use are not usually confined to blocks like we see on samplers. So to get a real feel for fillings like these, I think it helps to practice them in various shapes instead of square chunks. 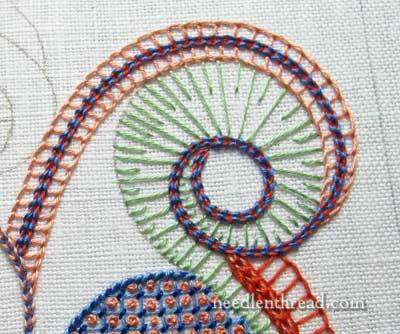 Here, you can see the double whipped chain stitch in use as a border. It makes a nice clean edge, with a little bit of personality thrown in. Griffin stitch, the tutorial that started my lattice infatuation, only shows up once on the sampler so far. 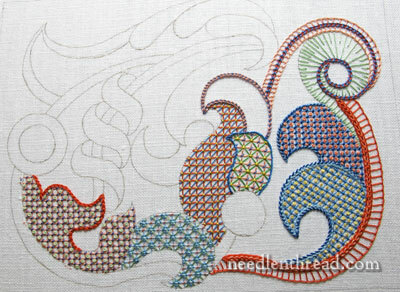 This is such a fun filling stitch! At the tip of this curly thingamabob, I’ve worked some long straight stitches and some short straight stitches, into a kind of snaily thing. I’m contemplating whipping those stitches – we will see. The dark line in red and blue that curls all around is this double whipped chain stitch again. The pale orange stuff is simply buttonhole stitch. It’ll be laced eventually, I do believe. Finally, here’s something I don’t like. I don’t mind the colors of the lattice so much – I needed something bright there – but the outline is pretty shoddy, so I will either remove it and redo it, or I might whip the stem stitch and see if that will help smooth it up. But this brings up a point that I mentioned earlier about lattice fillings: working the outline before you work the lattice is usually a better idea than working the lattice first and then outlining it. If you work your outline first, you’re sure to get a good, crisp outline. There are no stitches to interfere with the outline as you work it. On the sampler, in the lattice areas that I outlined first before working the lattice, the outlines look a lot better. In the areas where I’ve outlined after working the lattice, the outlines are not as smooth and precise. Several more lattice combinations are stewing right now. I’ll show them to you soon, so you can have a little bit of fun with them, too! 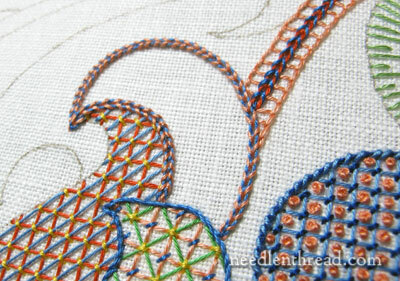 Stitch Fun is a series of embroidery stitch tutorials here on Needle ‘n Thread where we explore stitches and combinations of stitches just for the fun of it. 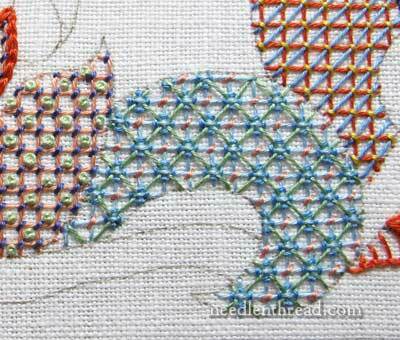 If you want to play around with some fun stitches, feel free to check out the Stitch Fun Index, where you can find links to all the tutorials in the series. The same point that i was going to come up with. It is better to make an outline first. Without proper outlining the sewed design will never look neat. BTW, your work is really inspiring. Dear Mary, you are so inspiring, and your website is SO helpful, thank you! I am simply in awe. I can’t wait to try some of the more complex techniques. Your videos give me confidence! Mary, I just love what you have done with the “Jacobean Jungle”. Fantastic! It so perfect. Such a clever girl you are. Thanks for the inspiration. It will be a good way for me to practice my lattice work. Thanks for showing us the latest on your Stitch fun dabbler. I love lattice stitch and you have certainly showed the different styles and techniques of the lattice stitch. I love the different shapes and styles of the pattern and the different coloured thread, it’s amazing the versatility of the lattice stitch. I can’t wait to see what you have been dabbling with lately do tell! look forward to that. Oh I do love all these thingamibobsnailystuffjumbly (strange, spellcheck reckons that’s wrong) things and their fillings. The info’s pretty good too. Thanks. Thank you so much for this sampler. It is full of inspiration and information. Your instructions are top notch. I’m loving watching it develop. I love what you’ve done with this so far, Mary. Can’t wait to see more. I read your e-mail everyday. I just read lattice sampler.I think this would be great to use in the empty spaces I have on my crazy quilt I working on. great lessons i am learning a lot.keep up the great work.